Bahr’s Park is special because of the people that live here. Our resident owned community creates a family environment. My husband and I have rented a RV site at Bahr’s park for 16 year. It was our intention to rent for one winter season and then try some other states until we wanted to settle down to one state. Well 16 year we are still at Bahr’s park. Why, because the people are so nice, the park has everything we wanted including golfing in the area. We have couples, men and ladies golf league. After 16 years I bought a park model. Why? Because of the people. As we were driving by Bahr’s park we saw a sign at the road side saying apartments for rent. We went in and rented one right away for the following year and stayed for 4 years. We couldn’t find anything we liked to buy at that time. We bought in another park, but missed Bahr’s so much we bought in Bahr’s the following year. We have been happy ever since and look forward to seeing all our friends from the park each year. Our little story about Bahr’s is as follows. We were looking for a campsite for one night 16 or 17 years ago and seen people working in the flower bed at the entrance to Bahr’s park and we stopped to see if they had any spots for the night. About 8 people took us to a spot on Michigan Ave and helped me park our motor home. We went to a supper with them at the big hall that night and everyone was very friendly. Due to the less cost and friendship we booked our site for a month and have been coming here every year since except one year we had medical problems and one year we tried Texas. We are Canadians and only one person for a short while seemed a little put out about us being in his country. We are now good friends and he greets us with open arms. There is always something to do if you want to take part or if you don’t wish to be part of an event that is up to you. My wife and I take part in a planed event ever day except for Sat. and Sun and if we wish it’s never hard to finds something on those days either. We now own a trailer in the park and are very happy there. It now is just like moving to our happy home away from home. We look forward to Bahr’s park for 120 days each year. The cost at this park is very reasonable and the people are friendly and helpful. We came to Bahr’s in 2002 to visit my brother. We really liked it and decided to rent an apartment the next year, which lead us to getting to know more of the people in the park. We totally enjoyed going to the entertainment and scheduled events as well as golfing on their men and women’s golf leagues. We decided to rent again and again until 2009 when we brought into the park and have enjoyed it completely. We are now a part of the Bahr’s Mobile Home Park Family and we love it and enjoying all of our new family members. We also find ourselves involve in other areas of the park, like becoming part of the committee that put together all the entertainment events and having so much fun working with the other ladies. 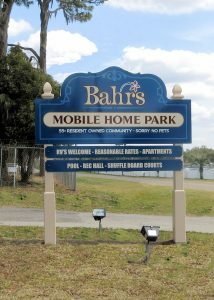 If you want a great place to spend your winters and still be with family come and join our family at Bahr’s Mobile Home Park. Lloyd and I have been in the park for 31 years and have enjoyed every one of them. We have met some of our closest friends here. There is always something to do, from picnics to pot lucks, dances, shuffling, golfing, to putting on a talent show once a year. You can take part or just set back and enjoy yourself. We have seen a lot of changes. The best of all was when we (the people) bought the park.. We, the shareholders, get to make the decisions large or small. We would highly recommend it for the winter or year around. You may just relax or be active. My parents came to Bahr’s in the early 80’s so we were able to see what a great park it was. When my parents passed and we retired, we started spending the winters there and have enjoyed the closeness of a smaller park.